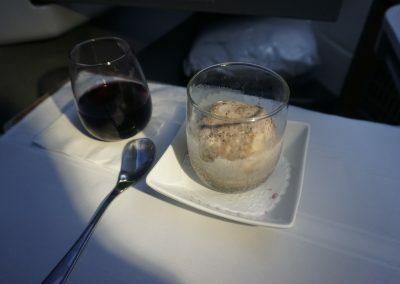 I’ve just returned from a quick trip to Madrid for the weekend and flew aboard American Airlines’ 777-300ER in Business Class. 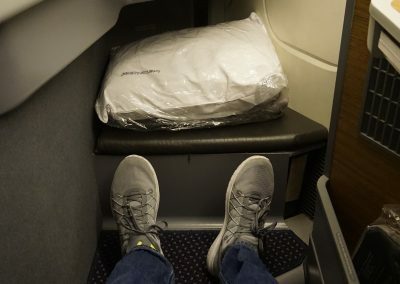 The 777-300ER is American’s “flagship” airliner and the only new American Airlines aircraft to feature both Business and First class.I was ticketed on American Airlines from DFW to London Heathrow and then connecting onto British Airways to Madrid. 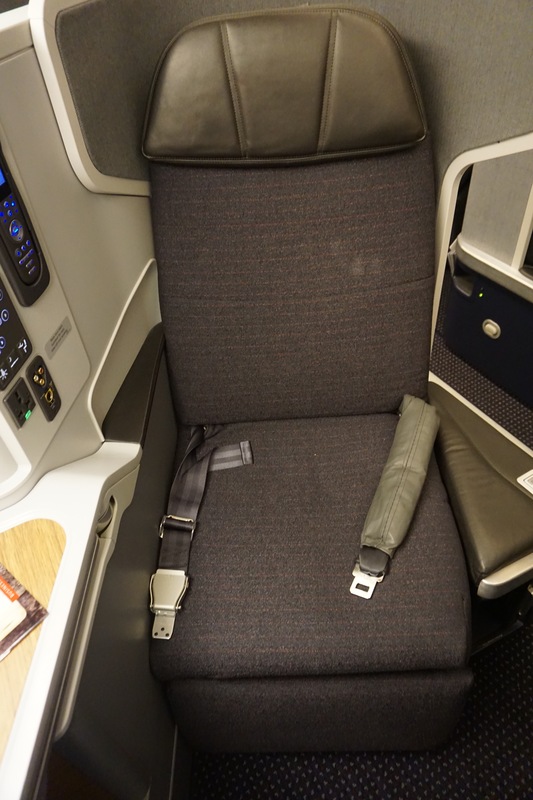 My ticket was purchased in Economy but I decided to apply an award upgrade to my outbound flight. 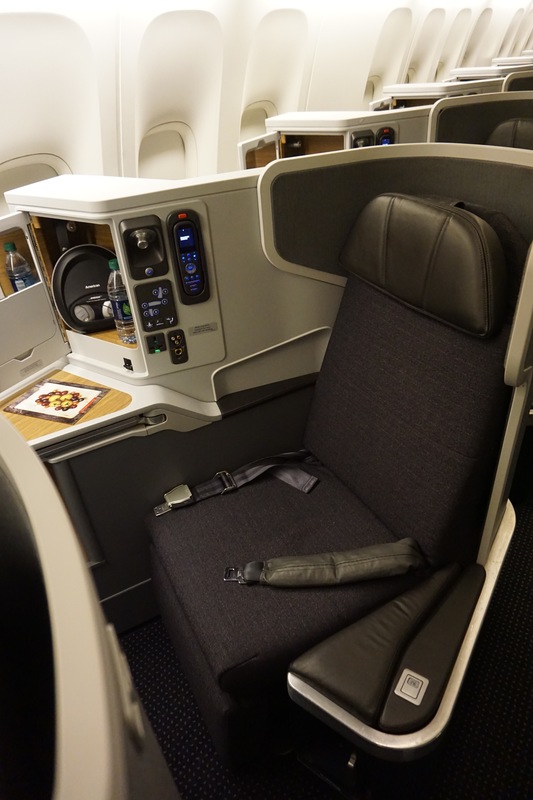 The upgrade was 25,000 AAdvantage miles plus a copay of $350. While not a spectacular use of miles, considering I have quite the surplus of Advantage miles , I’d say it was moderate value redemption. 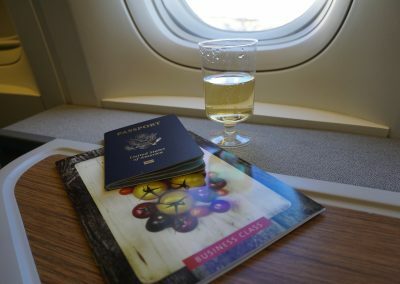 My upgrade cleared 3 days out from departure.I started the journey in my usual spot, the Terminal D Admirals Club at DFW Airport. The Friday evening rush was non-existent on this particular day which was a pleasant surprise. I enjoyed a quick glass of Prosecco and did a bit if planespotting before heading over to the boarding gate. We boarded at my least favorite gate, D23, as it is one of the most congested gates in Terminal D. But on the bright side, D23 is also right next to the Admirals Club so the walk is very short. On my recent trip to Hong Kong, we boarded through the same gate and it was a complete circus. Fortunately, this flight was unusually empty so boarding was very orderly. 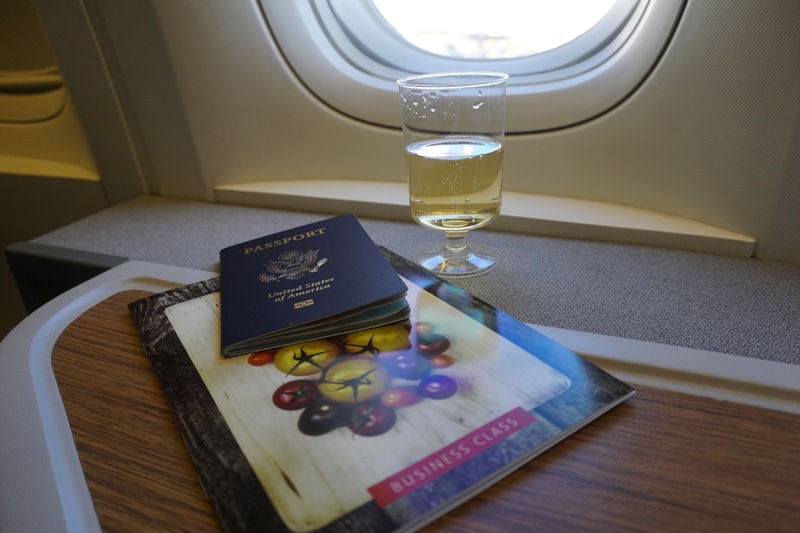 I was one of the first to board in Business Class so I was able to snap some quick photos. 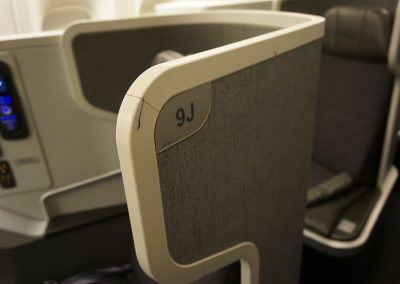 I took my seat in 9J, a window seat on the left hand side. 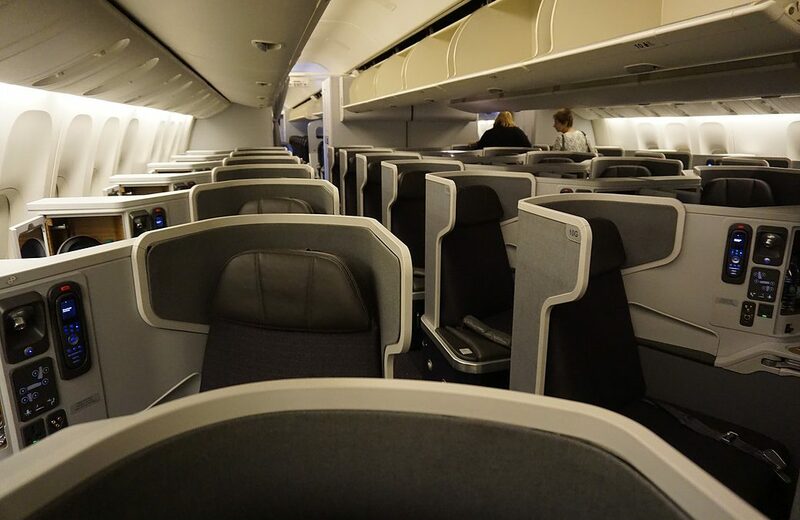 The 777-300ER Business Class cabin features Reverse Herringbone seating in a 1-2-1 configurations so all seats have direct aisle access. 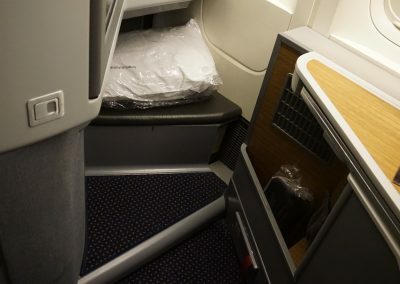 Business Class is split between two cabins: a mini cabin with just two rows near First Class and the larger, main Business Class cabin. 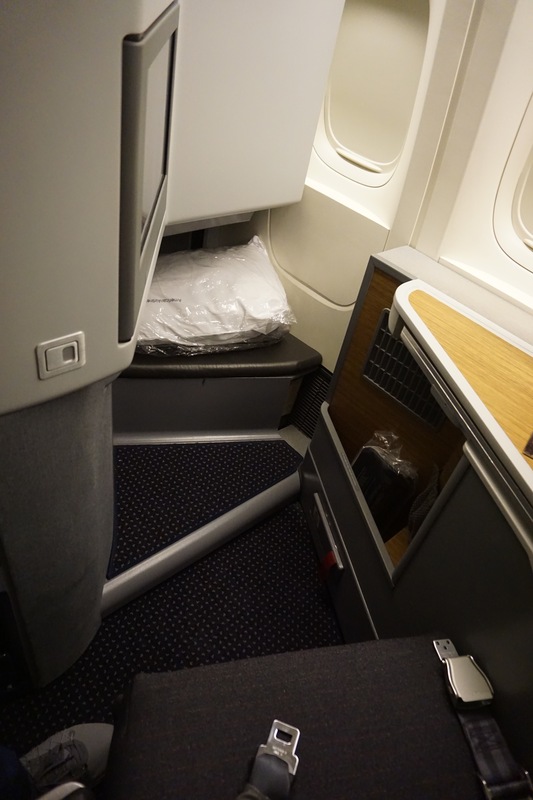 I had originally contemplated seat 4A in the mini-Business Class cabin. I read a couple of reviews on this seat and most said the seat was very noisy. I am very glad I did not select this seat as the galley and lavatory noise is quite significant. 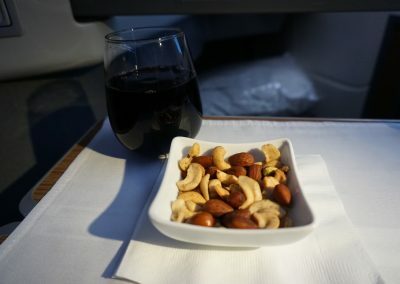 The crew started offering pre-flight beverages nearly right away. We were offered water, orange juice, or champagne. Of course I accepted the champagne, even if it’s served in a plastic cup. The crew was fairly senior and service was mixed. 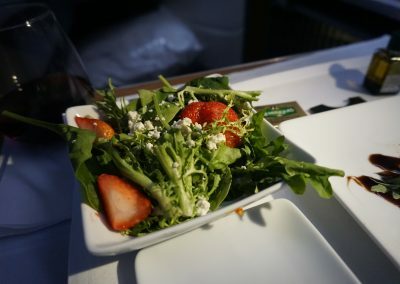 Some of the flight attendants were incredibly sweet and attentive. Others could care less about the service. 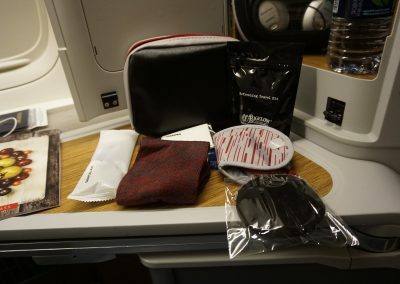 Multiple drinks were offered before the boarding door was closed.The amenity kit is the latest version which is designed by Cole Haan. 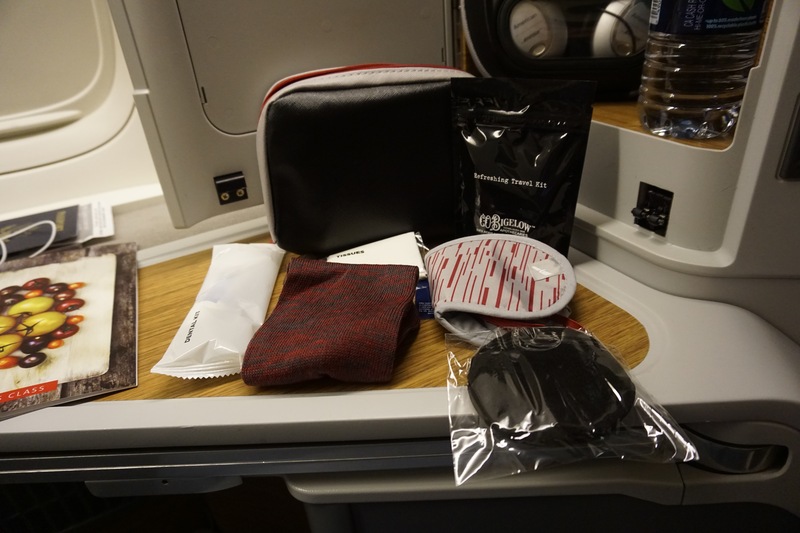 All the basics are in the kit and I think American Airlines overall has been gradually improving their amenity kits. 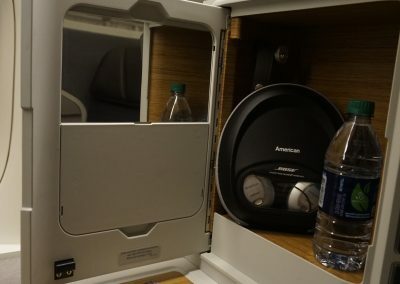 Bose noice-cancelling headsets are in the cubby at each seat. 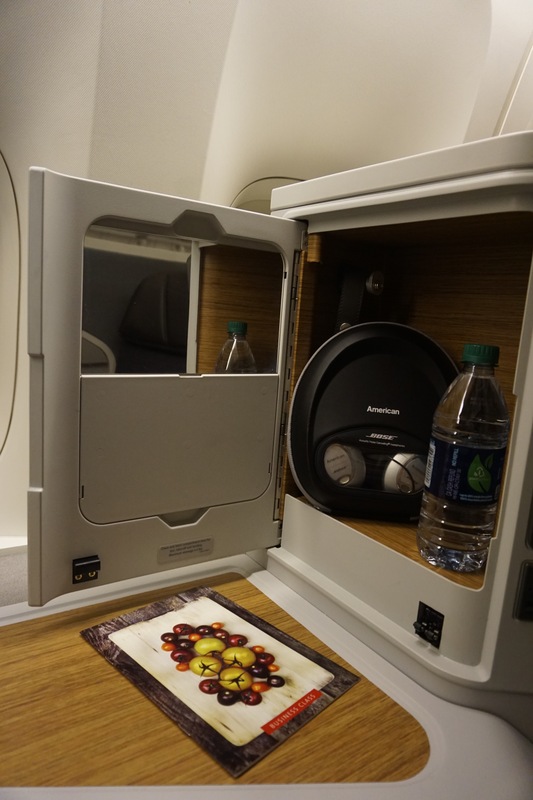 These are one of my favorite amenities in Business Class and do a fantastic job of cutting out noise. 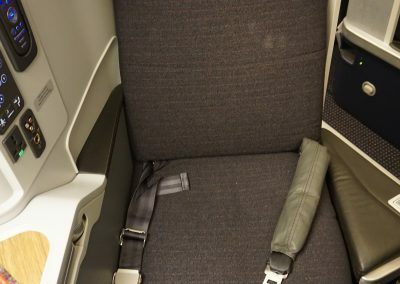 There’s also an nice shoe storage on the left hand side of the seat. American Airlines’ 777-300ER fleet is starting to show its wear a bit as their were some blemishes on the seats and plastic casings. Overall though, these are still very nice planes. The lavatories on the left hand side of the plane are much larger so keep that in mind if you need to change in the lavatory. 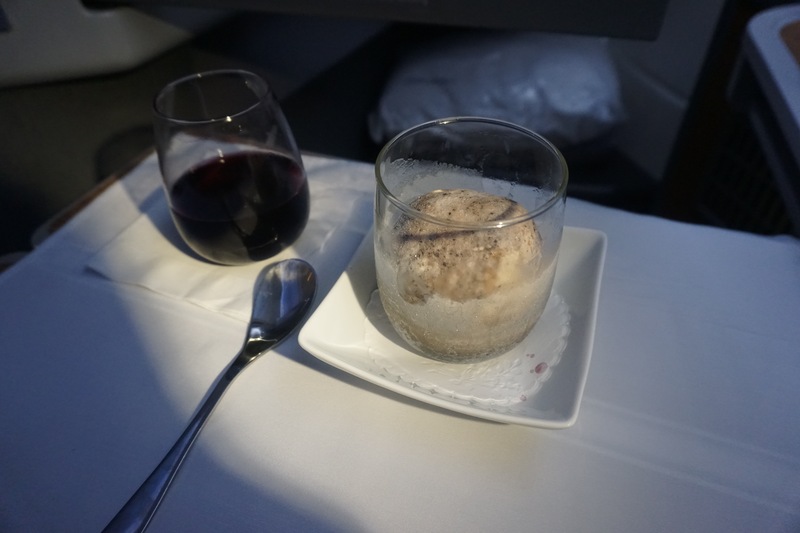 I didn’t snap any photos of the lavatories as…..well…..I think airplane lavatories are pretty gross. They do however, have decent 3Lab amenities in the lavatories. We departed on time at 7:10 PM CDT and were up in the air, London-bound. 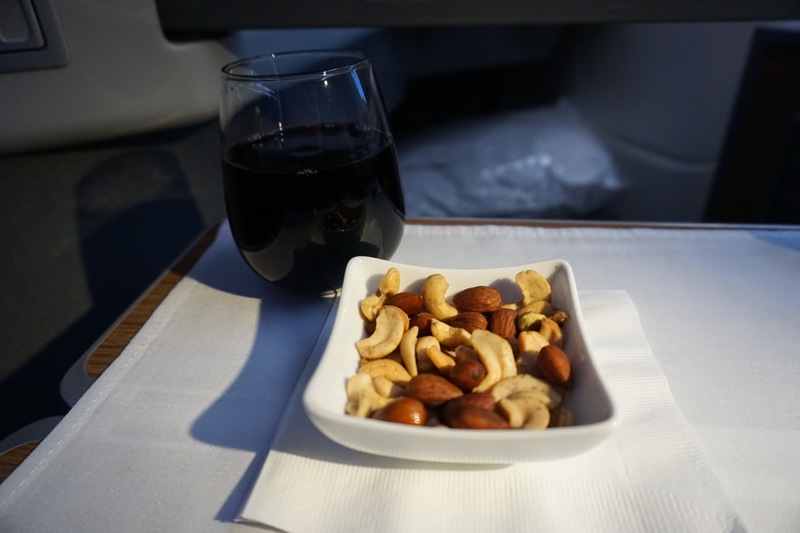 In-flight service started with warm nuts and beverages. I started with a glass of red, the Lavau Vacqueryras, Rhone Valley. 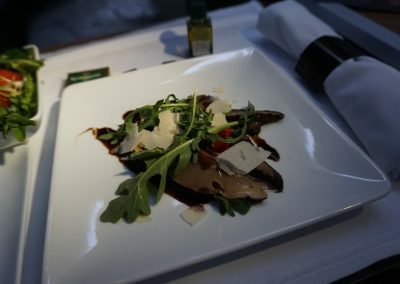 Following that was the starter course which consisted of a spinach salad with strawberries and a Portobello mushroom carpaccio. 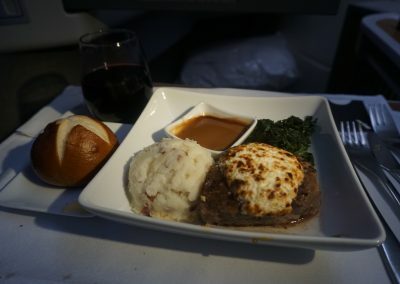 The starter course was excellent and probably the best course of all.The main course followed and I opted for the Boursin-crusted beef filet. 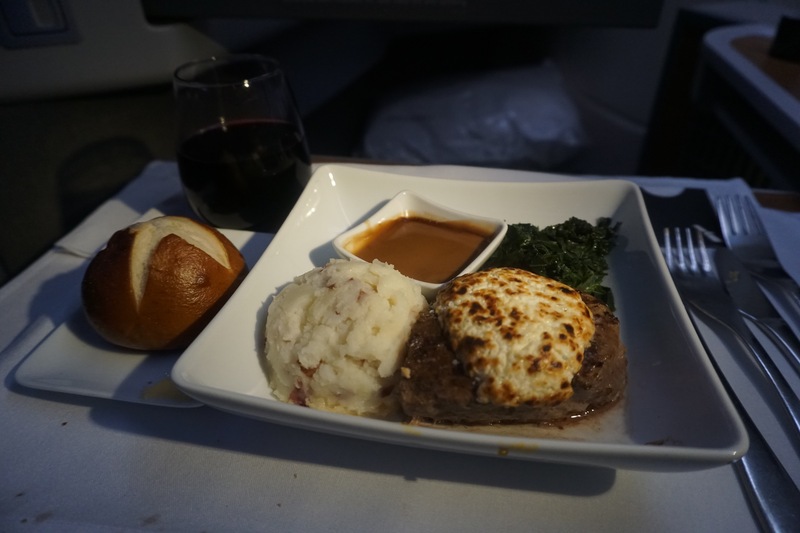 I always expect that an in-flight filet is going to be overcooked and while this one wasn’t terrible, it was a bit overdone. It was paired with mashed potatoes and kale. Dessert followed and I opted for the classic ice cream sundae. It was QUITE frozen so I had to let it thaw for a bit. After meal service wrapped up, I watched a bit of a movie but was fairly tired. The IFE screen is rather large but the display quality is quite low for such a new plane. 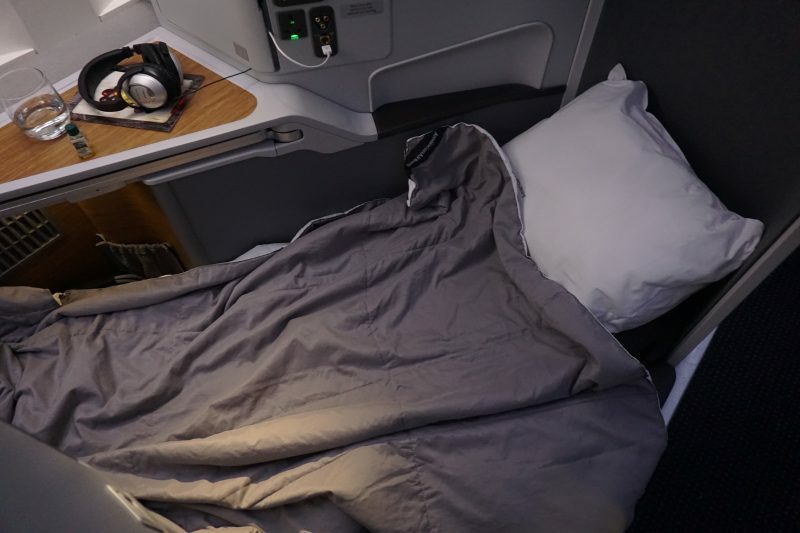 I decided to put the seat into bed mode and get some sleep. The bed is one of my favorite hard product beds. It features a nice amount of privacy and comfort. Ultimately, I got a very solid six hours of sleep on the way to London which was quite refreshing. 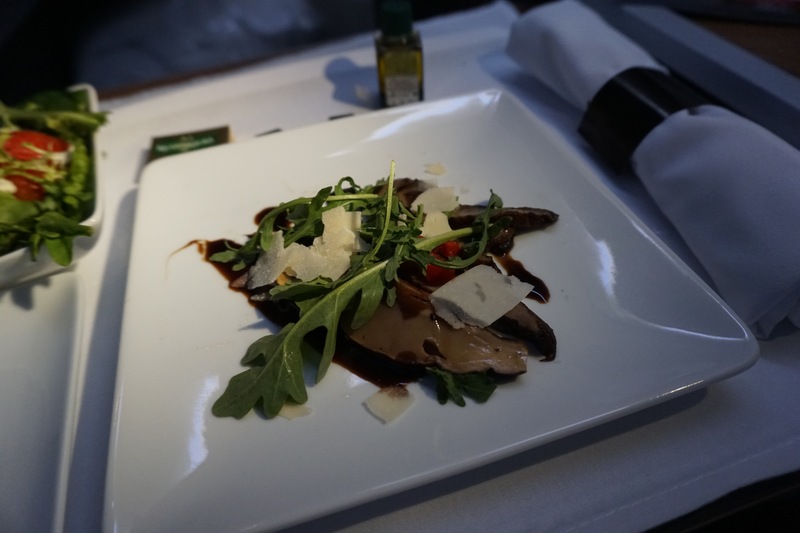 Breakfast service started just over and hour out of London Heathrow. 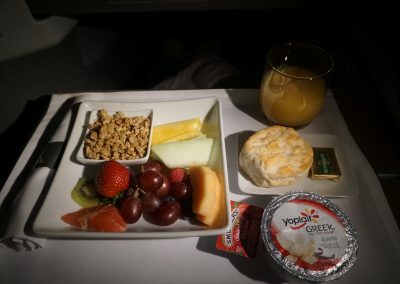 Breakfast was pretty bland with fruit and yogurt or a quiche as options. 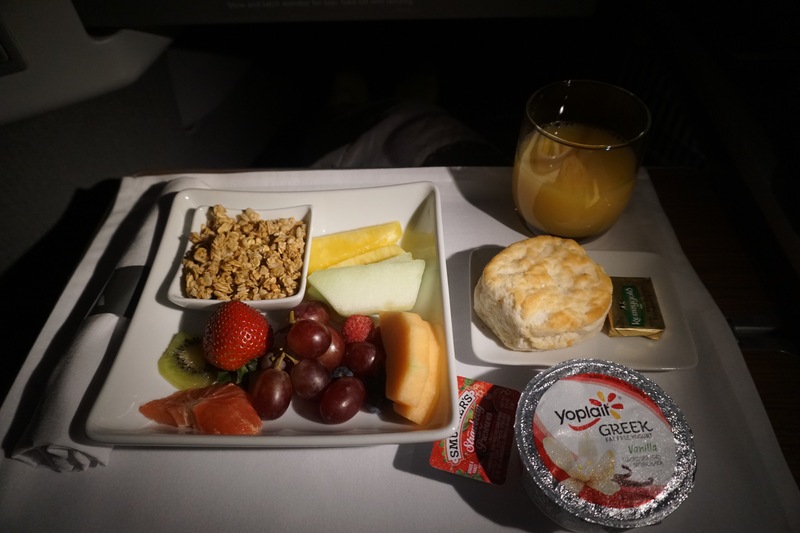 I opted for the fruit and yogurt as the fruit sounded a bit more refreshing.As we approached London, landing cards were passed out and the Bose headsets were collected. It would be nice to be hang onto the headphones until landing, but American Airlines wants to avoid any lost sets. The crew was fairly rushed in preparing for landing so the cabin got quite noisy. We arrived at Terminal 3 and disembarked. 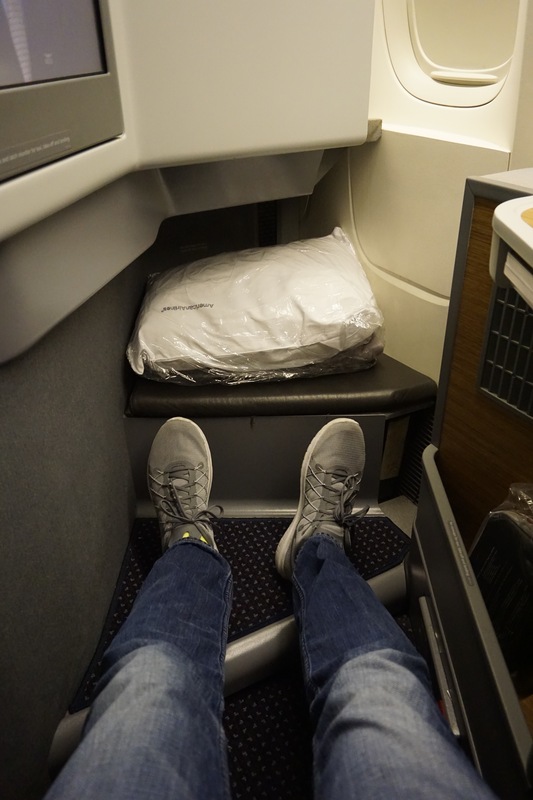 I had a nice long connection at LHR so I planned a decent amount of lounge time. 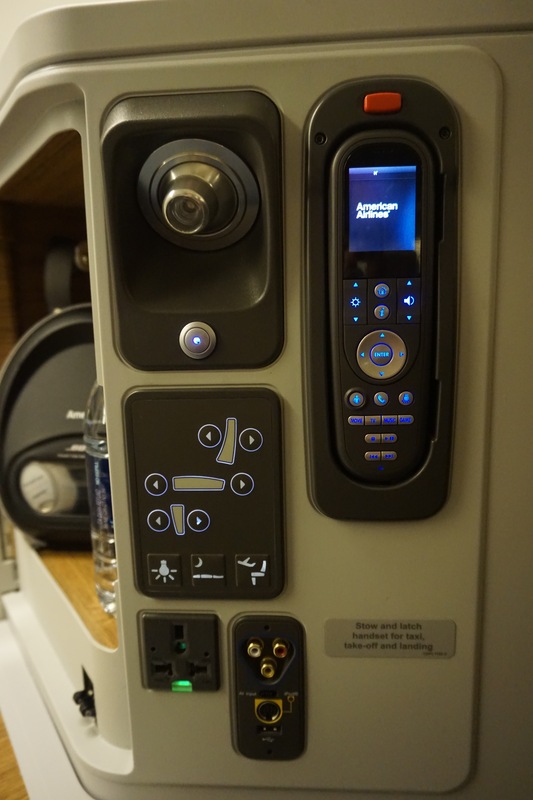 Overall, I’m a big fan of American’s Business Class hard product on the 777-300ER. 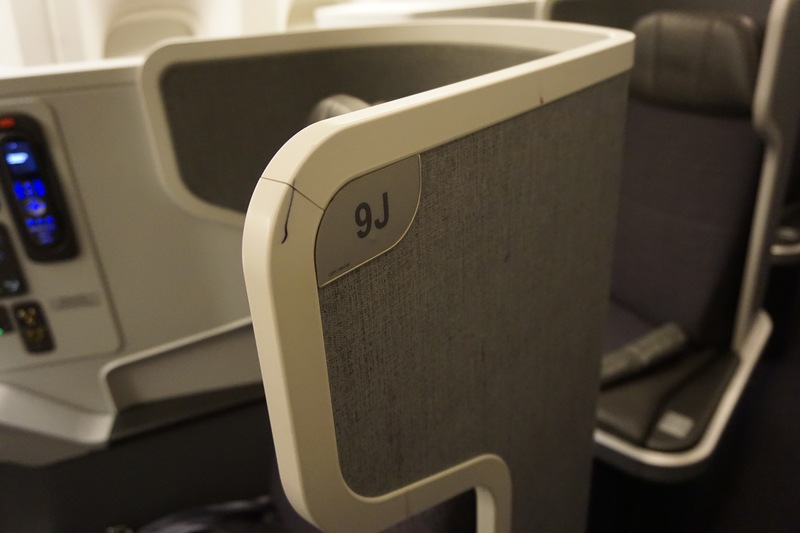 The reverse herringbone seats offer a comfortable lie-flat bed with lots of privacy. 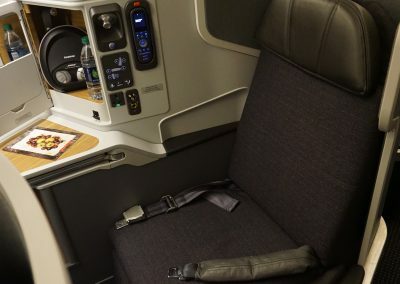 I would avoid sitting in row 4 due to the galley noise but I don’t think you can pick a bad seat in Business Class.On service, American Airlines can really be hit or miss. I did enjoy interacting with some of the crew members while others were sour. 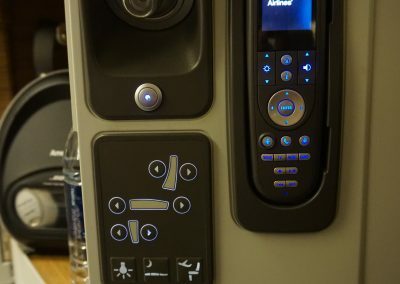 The soft product on American Airlines still has room for improvement. 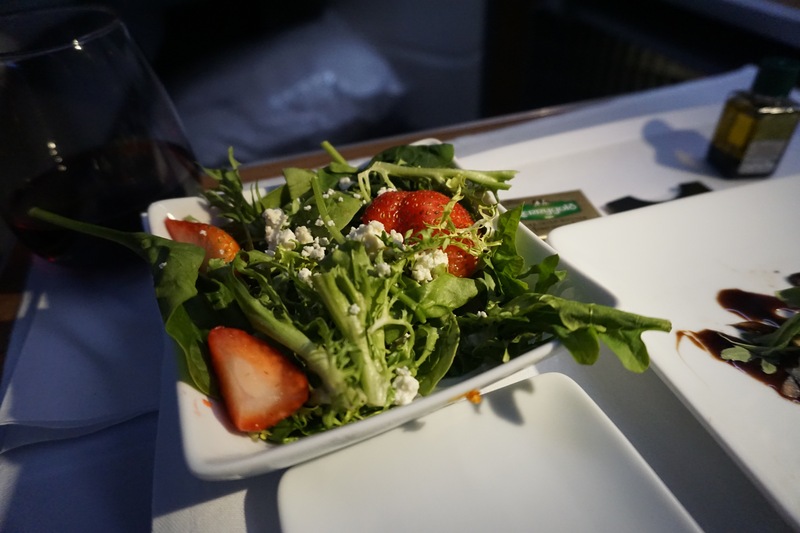 In the end, the upgrade was well worth the comfortable bed, the upgraded food, and improved service. I would love forward to this product again any day!